Benefits Gambir is a kind of dried sap from the leaves and twigs extracts squeeze namesake plant (Uncaria gambier Roxb). 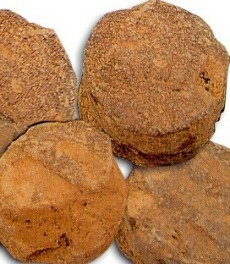 Benefits Gambir in Indonesia are generally used in menyirih. Usability is more important as a tanner and dyes. Gambir also contains catechins (catechin), a natural material that are antioxidants. India imports 68% of the Indonesian gambier, and use it as a compound menyirih. The primary use is as a component menyirih, who had known the archipelago, from Sumatra to Papua since at least 2500 years ago. Known, gambier stimulates lymph bile which helps smooth the process in the stomach and intestines. Another function is as a mixture of drugs, such as burns, migraine headaches, diarrhea, dysentery medication, mouthwash-gargle, mouth ulcer medications, and skin pain medication (smeared), tanneries, and textile dyes. Functions are also being developed as a glue plywood or particle board. This product still has to compete with other sources of wood adhesives, such as Acacia mearnsii bark, wood Schinopsis balansa, as well as leather pod Caesalpinia spinosa produced in other countries. The main ingredient, and also contained many other Uncaria members are flavonoids (especially gambiriin), catechins (up 51%), tanning agents (22-50%), as well as a number of alkaloids (such gambirtannin and dihydro-and oxo derivatives him. In addition, gambier used modern medicines produced German states, as well as paint dye, clothes.